Thank you for dedicating your time to helping us conserve and steward our protected lands, because of your efforts we can manage our more than 2,200 acres of green space in the Pittsburgh region! 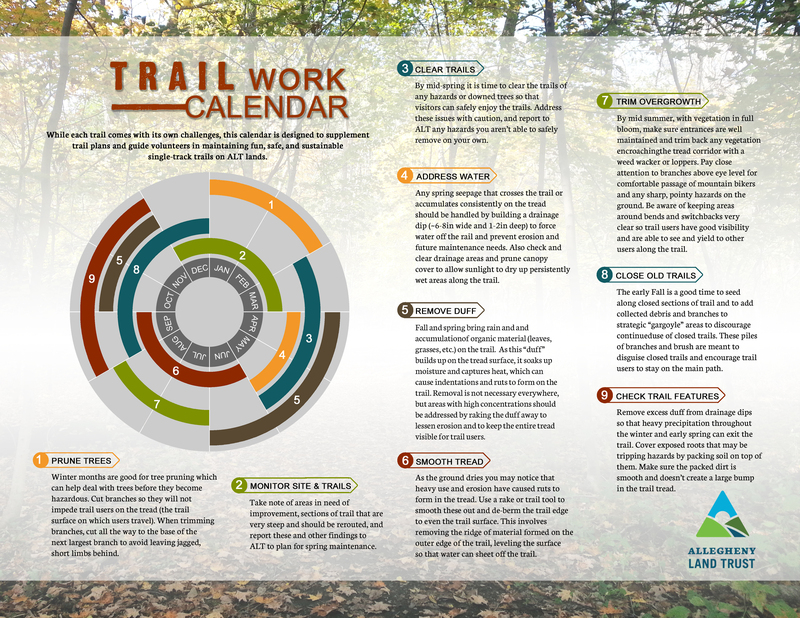 This page is home to reference material, tools, and resources to help guide our independent Land Stewards like you at our conservation areas. Every Land Steward should review these documents and please use the Hours Log to keep track of your time. Steward Job Description—What you’re signing up to do as a Steward. ALT Waiver—Make sure you have signed one of these before working and update every year. Volunteer Hours Log—Where to keep track of your hours worked; this helps us show our appreciation to you, and can also help us achieve more grant dollars. These documents outline main tasks on our Feature conservation areas where we have projects requiring more ongoing maintenance than what is described in the Job Description. Our trails require regular monitoring to help identify issues and maintenance during each season. This calendar outlines what regular work needs to be done and when. We work to remove or control the spread of exotic and invasive species on all of our properties and some have targeted ongoing restoration projects. These guides will help you to identify and understand invasive species. Refer to a specific property task list, or contact our Stewardship team for details on specific projects. Invasive Plants of Pittsburgh Guide Commonly found invasive species in Pittsburgh as well as removal methods. Want to contribute to a project that goes beyond ALT? Check out these projects you can take part in to collect data for ongoing research. Join an existing ALT project, or start one on your own! Project Bee Watch Contact Caitlin about joining this Pollinator project at Audubon Greenway. iNaturalist Check for your property and add observations when in the field, or help others by identifying their records. iMapinvasives For the more experienced tech user, identify, monitor, and survey invasive species. Lost Ladybug Something is rapidly changing with the native ladybug populations, help observe ladybug species to figure it out. Firefly Watch Spend an evening watching fireflies and help a team of Universities research what is impacting firefly populations. Bud Burst Record observations during plant life cycles to help research the effects of Climate Change.